Prime your taste buds for a diverse array of mouth-watering Thai recipes. I am almost sure that for many of us, we have this clandestine desire and absolute craving for some exotic, hot and spicy food. Some of the most exciting cooking trends emanate from Southeast Asia and Thailand surely is no exception. Thailand also has its own unique preparation style, keen attention to detail and thrives on serving only the freshest of ingredients. It is important for me to tell you that with my vast interest and knowledge in the fine art of Asian cooking methods, you may or may not be surprised to know that many of the recipes summarised below are prepared not only for their appreciative taste but also for their remarkable medicinal value. 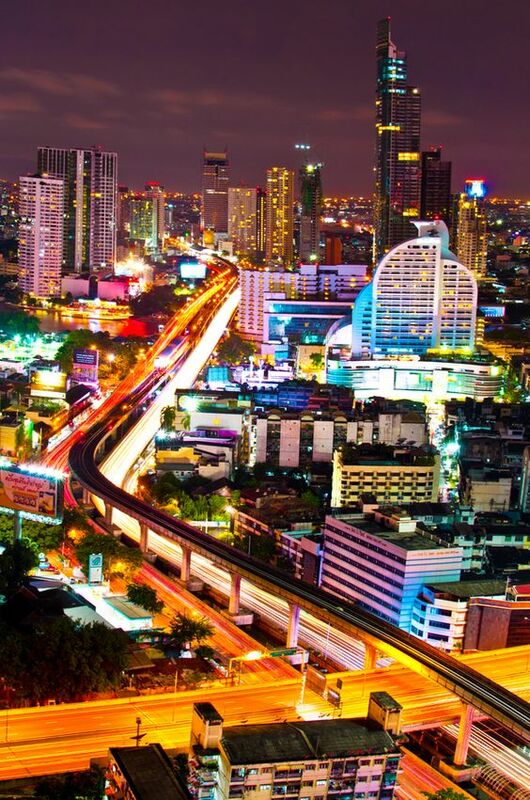 I acquired considerable experience in many aspects of my travels around Southeast Asia and that is to say, not just the travel part itself but also the diverse cultural and social side too. I'd love to share a few examples of some of the excellent health benefits you'll no doubt gain when applying the various herbs and spices found in Thailand in your cooking. They would most certainly help assist in approving your well-being. Besides, what have you got to lose? Perhaps only a few pounds. 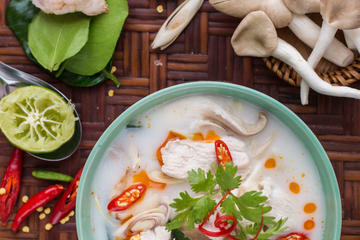 One of the main ingredients utilised in many Thai Soup Recipes is coconut milk which is hardly surprising as Thailand has some of the biggest coconut plantations in the world due to its location in the tropics. The recipes that I will share with you on this page are primarily chicken based and flavoured with lemongrass stalks, kaffir lime leaves, galangal and Nam pla fish paste. Tom Yam Kung is the Thai name given to probably the most popular spicy seafood soup emanating from Thailand. So much so that it's fast becoming extremely well known throughout the rest of the world. You need only visit the tropical paradise once to be aware of its superior classic proportions. Since you've come here to take a look at some amazing Thai recipes, how would you like to join a local cooking class to truly experience the art of Thai cooking. Take advantage of a special full day class that will give you the opportunity to cook like a professional chef and as a bonus, we'll be throwing in a waterfall sightseeing tour too. For more details, simply click the link above. With 10 dishes taught daily, a market tour, fruit carving, recipe guide and a certificate of achievement, the answer is clear why we are considered one of Thailand's best cooking schools. 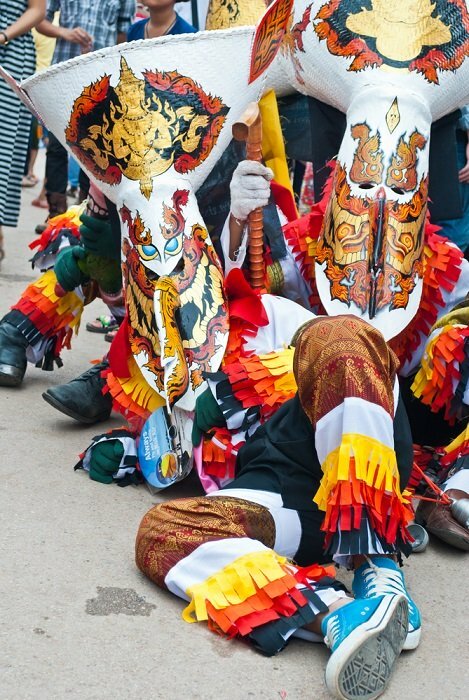 Not only that, you'll be taking part in one the most celebrated aspects of Thai culture. Come and enjoy the day with our highly renowned chef and take home a skill that will surely impress your friends. If you think you are capable of creating some delicious crisp and crunchy Thai-style Spring Rolls then why not try the very popular Thai version. The recipe can be aptly achieved using a noodle and bean sprout mixture with either pork, chicken, shrimp or a delicious vegetarian filling. It's easy to prepare, takes about 10 minutes to cook and is the perfect appetiser. Try these wonderful quick and easy to prepare Fish Cakes made with fresh cod, green beans, red curry paste, cilantro and Kaffir lime leaves. They are a popular appetizer in Thailand and usually served with an ice cold Thai beer or your own special brand. These cakes also go down well with a cucumber relish made with ginger root and pickled garlic. Try this straightforward, quick and easy Thai Chicken Stir Fry with fresh Thai basil and fresh Red Cilli. This delicious dish is an excellent introduction to Thai cuisine and will certainly get your taste buds tingling. Thai Style Barbecued Chicken marinated with coconut milk, lemongrass, ginger and garlic is a firm favourite form of food enjoyed by both tourists and locals alike almost everywhere in Thailand, from the portable roadside stalls, to sports stadiums, festival events and even on a host of beaches. This hearty Thai Beef Salad combines the taste of succulent and tender strips of sirloin steak, cucumber and red onion with hot red chillies and lime juice. It's a delightful and delicious Thai salad that could easily be the main meal. Green Papaya Salad is a fabulous alternative to the usual Greek, Italian and common garden salad that most westerners have come to recognise. The green salad recipe on this page is a particular firm favourite among South-East Asian fare and includes a great diversity of ingredients such as garlic cloves, red chillies, shallots, snake beans, Nam pla fish sauce and lime juice. Crushed peanuts and thinly sliced chillies are used as a garnish. Try some of these delicious Thai Style Fried Bananas that not only make wonderful snacks but are also available almost anywhere in Thailand from the portable roadside stalls to the floating markets. You see them being frequently fried during the vegetarian week, which is between September and October. You can bring the fantastic flavours of Thai cuisine into your kitchen with a simple trip to the grocery store. Nancie McDermott, an experienced cook, teacher, and author of the best-selling cookbook Real Thai, presents a collection of 70 really delicious Thai recipes that focus on easy-to-find ingredients and quick cooking methods to whip up traditional Thai recipes. With recipes like Crying Tiger Grilled Beef, Grilled Shrimp and Scallops with Lemongrass, Sticky Rice with Mangoes, and Thai Iced Tea, along with McDermott's highly practical array of shortcuts, substitutions, and timesaving techniques, you can prepare home-cooked authentic Thai meals as often as you like. You can order a copy of this book by clicking on the link.